Water is very important for producing high-quality crops. 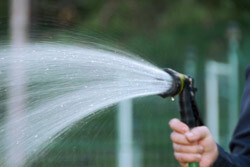 Although rainfall is a good source of water, there are usually some dry periods during the growing season when you will have to water your garden. It is important to do it properly. When to water. Water plants once a week during dry periods (when less than an inch of rain falls during a week). Water early enough in the day so that moisture on the plants will dry off before dew appears; this will help prevent disease. How to water. Soak the soil thoroughly to a depth of at least 6 inches rather than sprinkling the garden lightly at frequent intervals. The water should get down into the root zone of the plant. About 1 inch of water a week, including rainfall, is desirable for vegetables. To measure the amount you are applying, place 4 or 5 cans in the area being irrigated. They will collect approximately the same amount of water as the soil.